When Geoffrey Boothby was seconded to the Royal Engineers in 1915, he was twenty- one and Edith Ainscow was eighteen. They had spent only four days together before Geoffrey was sent to the Front and the subterranean struggle below the Ypres Salient, in tunnels that were narrow, dark, flooded, and in deadly danger from the German workings close by. During the next 18 months, as their letters passed to and fro, they fell in love. Toen de zoon de brieven ontdekte wist hij niet dat Geoffry bij de TC zat ( Tunnelers Compagnie). Hij kocht het boek Beneath Flanders Fields van Peter Barton, Peter Doyle en Johan vandeWalle en ontdekte via dat boek eigenlijk het belang van de brieven. Hij nam contact op met Peter Barton en zo is het balletje aan het rollen gegaan. Peter Barton kwam nog met de aanvullende informatie dat Geoffry vermoedelijk is omgekomen op Railway Wood. Op deze site worden 12 'tunnelers' van de 177th Tunneling Company, Royal Engineers herdacht die ondergronds omkwamen. Er staan géén grafzerken maar wel een 'Cross of Sacrifice' met op de basis ervan de namen en volgende tekst : "Beneath this spot lie the bodies of an officer, three N.C.O's and eight men of or attached to the 177th Tunnelling Company, Royal Engineers, who were killed in action underground during the defence of Ypres between November, 1915 and August, 1917." De hele site wordt als één graf beschouwd en heeft, samen met het toegangspad, een oppervlakte van 87 m². Het terrein is afgesloten met boordstenen en paaltjes met ijzerwerk. My old friend Arthur Stockwin, Professorial Fellow of St. Anthony's College, Oxford, visited me in Tokyo earlier this year. He told me an intriguing story, and this is it. As a boy, he said that his mother Edith took him to Stratford-upon-Avon several times to visit an old lady friend. The young Arthur would generally go outside to play. But one time, in the living room, he noticed a black metal plaque issued by the War Office. Such plaques commemorated a World War I soldier whose life was lost in action. The memory of these visits naturally paled over the decades, but it was given a jolt in 1990, a full seven years after his mother's death, when Arthur returned to the family home to deal with the many belongings left there. Among them was a large wooden chest. In it he found a packet of old letters bound with string. The letters were dated 1915 and 1916, and they were sent between his mother, who was then 17, and a 20-year-old soldier named Geoffrey Boothby. They were letters exchanged between a young man and woman who knew each other for a bare four days, but whose affection and love for each other grew with every letter. Geoffrey Boothby was killed on April 28, 1916, buried in a tunnel 10 meters below the ground at Ypres in Flanders. Arthur's mother, Edith, was never to see him again. Yet she married, had a child and lived a happy and productive life until her death at age 86. Long after World War I was over, she continued to visit Geoffrey's bereaved mother in Stratford-upon-Avon. Prof. Stockwin has now published the letters of Geoffrey and Edith in a book titled "Thirty-Odd Feet Below Belgium -- An Affair of Letters in the Great War, 1915-1916." It is an extremely affecting book about the tragic loss of a single soldier and a love that might have been. Ironically, of course, had Geoffrey Boothby lived, Arthur Stockwin would not have been born to produce this book for us now, a century after the "Great War." It is evident from the initial letters that the young man is bucked (the slang at the time for "delighted") to be fighting for king and country. He refers to the German enemy in derogatory language and makes light of the danger, though this may well be a cover for fear. "Took us three hours [to lay a charge]," he wrote Edith from the front on Oct. 13, 1915. "This was made rather exciting by the fact that the Huns were almost certainly doing the same thing further along the gallery. We got our blow off first though. Some sport! What! Cheero, dearie! Geoff." It isn't long before "Dear" becomes "Dearest" in Edith's letters, and he is calling her "Darling." He describes the "sodden clay" and the lack of light. In fact, the 40,000 tunnellers -- not many when you consider there were upwards of 6 million soldiers in the field -- probably had the worst job of the war. At any moment, the heavy wet earth above, propped up by wooden planks and sandbags, could shift and crush them to death. Edith sends him poetry. "Sleep, thou darlingest boy of mine, I will rock thee, my child, and guard thee." This surely comforted Geoffrey, who confesses to her, "Not till this evening have I realised what a terrible place the firing line is. I might be shot or shelled or gassed or bombed. I may fall into a deserted trench & be left to drown. What if they blow a mine? What if aeroplanes start dropping hate? . . . I could continue to write a volume of 'what ifs.' "
On March 20, 1916, he tells her of what he called, in an earlier letter, the "Irony of Fate." "Nearly all of my friends in the Staffords [Staffordshire Regiment] have been killed in the fighting round Ypres a few weeks ago. It's a horribly sad thing how many friendships have been made & broken by this war. But it does make one feel really proud to be an Englishman, when one knows how unselfishly one's friends go west." Just a day before Geoffrey died, Edith, as ever then in Birmingham, sent him a letter that he would never receive. "I've just got a beautiful new perfume. Can you smell it and do you like it? I couldn't resist the name -- Fleurs d'amour." She was 18 then, and Geoffrey had turned 21 while at the front. His last letter to her, dated one day before his death, is terse. "Leave postponed a week. . . . The hope I mentioned is now far stronger, but please don't build too many castles in the air. I should hate to disappoint again." Her very last letter to him is dated May 4, 1916. "I can't really believe that you're coming yet, but I hope and hope and hope. Do, do be careful just for a week and let's hope the Fates will be indulgent for once." She, of course, did not know that the Fates had already made their move. "Deeply regret to inform you 2 Lt. C.G. Boothby was killed in action April 28. Lord Kitchener expresses his sympathy." Incidentally, Field Marshal Horatio Herbert Kitchener, 1st Earl Kitchener and Lord Kitchener of Khartoum, was himself killed on June 5, 1916, when a cruiser taking him to Russia hit a mine and sank. He was 66. 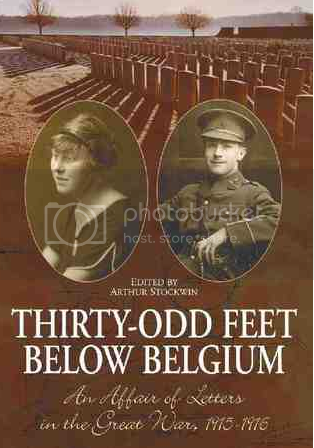 "Thirty-Odd Feet Below Belgium" is a deeply moving book, including photographs, letters by Geoffrey Boothby's comrades-in-arms to his family, and an epilogue by Arthur Stockwin. Geoffrey's mother, Alice, also wrote a poem that is reproduced here and ends, "I shall always wonder over you, and look for you. And you will always be with me . . . "
It was the same Alice, who as a frail old lady, Edith visited with her young son, Arthur, so many years after both women lost Geoffrey. Is there a moral in this story? I suppose there is more than one. Was Geoffrey Boothby's death senseless? Who was to blame? Why do we continue to subject others to such a fate? We who live a century after "the war to end all wars" may well ask ourselves these questions. Bestaat er van hem een foto? Het boekje is aanwezig in de bib "De Vriendschap" te Roeselare, op de kaft staat zijn foto. Ik heb het boekje gevonden in de Ieperse bib als "Een liefde in Postwissel". Alles vertaald. Maar ik heb het niet direct eens goed bekeken. Wel een leuk boekje. Ik heb ondertussen wel een foto van hem. Zeker een goed boek(je). Vrij intiem. Ik heb hem met de titel "Een liefde in brieven" uit 2006. Op kaft en ik boekje staat dezelfde foto van hem. Hebben deze boekjes een ISBN-nummer of een uitgever? Ik vind ze op google nergens terug. Ik heb het boekje gevonden in de Ieperse bib als "Een liefde in Postwissel". Binske, had je al even een berichtje apart gestuurd. Maar bij dit soort boekjes kan het zijn dat de boekhandel ze niet meer kan bestellen of leveren. Tip van mij. De Slegte heeft ze af en toe, daar kocht ik ooit die van mij ook. Bedankt mannen, op naar Antwerpen dan maar. Bij boekwinkeltjes.nl staan er een aantal te koop. Tis een mooi boekje, wel een aanrader.